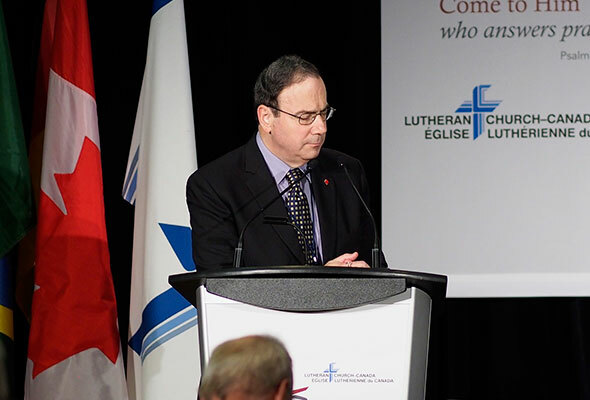 VANCOUVER – During its Saturday afternoon session, the national convention of Lutheran Church–Canada passed a resolution expressing its sorrow over the recent shooting tragedy in Moncton, New Brunswick. In adopting the resolution, the convention noted that “our Synodical family cannot help but be reminded of the sorrows endured by the families of RCMP Constable Peter Schiemann and his colleages in a similar tragedy at Mayterthorpe, Alberta.” Constable Schiemann was the son of Rev. Don Schiemann, President of the Alberta-British Columbia District of Lutheran Church–Canada. Following the resolution, President Robert Bugbee of LCC interrupted convention business to call for a time of prayer. In his prayer, he asked for comfort for the grieving. He also thanked God for the public witness of Rev. David Milette and Good Shepherd Lutheran Church in Moncton in the face of this tragedy, as they seek to share God’s love with the hurting.